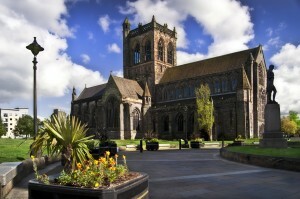 Paisley Abbey was founded in 1163 by the High Steward of Scotland, Walter Fitzalan. This fascinating building was the birth place of the Stewart Dynasty. Its stained glass windows, ancient tombstones and beautiful carvings are just some of its interesting features. In the Abbey grounds are statues of Paisley poet Robert Tannahill (1774 -1810) and poet-ornithologist Alexander Wilson (1766 – 1813). Paisley Abbey was founded when Walter Fitzalan, the High Steward of Scotland, signed a charter at Fotheringay for the founding of a Cluniac monastery Walter Fitzalan, the High Steward of Scotland owned land in Scotland and Walter Fitzalan built his Castel in Renfrew. Thirteen to set up the priory on the site of an old Celtic church founded by St. Mirin in the 6th century. In 1245, the priory was raised to the status of an Abbey, answerable only to the pope in Rome. The Abbey was dedicated to St. Mary, St. James, St. Mirin (the ‘local’ saint who had first brought Christianity to this part of Scotland in the sixth century) and St. Milburga. The Abbey was also a place of learning that of William Wallace, born 1270 Elderslie, Renfrewshire, Scotland who played a prominent part in the Wars of Independence in the 13th century, was educated by the monks of Paisley Abbey. Sir William Wallace Our Guardian of Scotland. 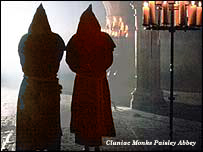 During the Year 1307 much of the Paisley Abbey was destroyed and burned by fire the English Army in 1307 The monks at the Abbey helped Scotland during the Scottish Independence against England. The Abbey was restored during the fourteenth Century. After the Battle of Bannockburn in 1315 Walter Fitzalan the sixth High Steward, married Marjory Bruce, the daughter of the famous Scottish king Robert the Bruce. Sadly, the following year, Marjory died at the Abbey following a tragic riding accident nearby, but the baby in her womb was saved and he became King Robert II of Scotland, the first of the Stewart monarchs. It was then the Abbey became to be the ‘cradle of the Royal House of Stewart.’ Our Queen Victoria and our present Queen is descended from him. In fact, the Abbey is the final resting place of six High Stewards of Scotland, Princess Marjory Bruce, the wives of King Robert II and King Robert III for whose tomb, Queen Victoria provided a canopy in 1888. The Abbey tower in the mid-16th century collapsed and destroyed the transepts and choir and a wall was built across the east end of the nave. At the Scottish Reformation in 1560, the monastery was disbanded, the monastic buildings handed over to the Hamilton family and the walled-off nave became the parish church of Paisley. The transepts and choir were to remain in ruins until the late 19th and early 20th centuries when they were restored to create one of the finest churches in Scotland. 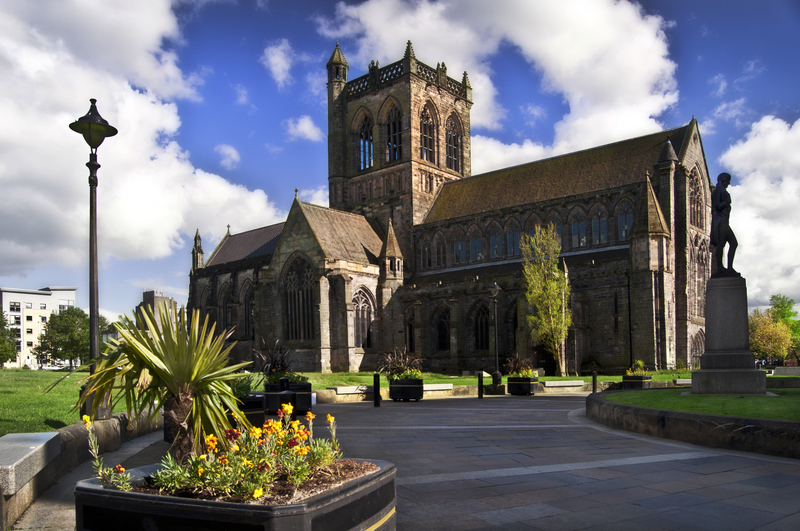 Visiting the Paisley Abbey, you will see the Restoration work from the last 800 years and continues today.